A synthesis of custom-fit technology and “off-the-shelf” convenience, the Edge takes immediate-fit bracing beyond the boundaries of “off-the-shelf” and into high performance. The Edge features a hand-laminated, carbon fiber frame with semi-rigid cuffs that conform to the unique size and shape of each individual patient throughout the various stages of recovery. 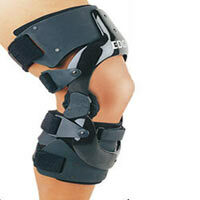 Patella Cup, Flexion Stop, XCL and Post-Op conversion kits allow the Edge to adapt to your patient’s unique needs. And a limited lifetime warranty insures the Edge will be there when your patients need it. Edge Lite incorporates all the features of the standard Edge, but uses less material, resulting in an even lighter weight brace for non and low contact/impact activities of daily living.